“The growth of coffee houses across the Capital has accelerated in recent years to the point where it is difficult to even pick the top ten. But, there’s been an increasing demand recently for specialty-focused coffee shops that have a distinctive aesthetic and by ‘George’… Washington, DC has it now! 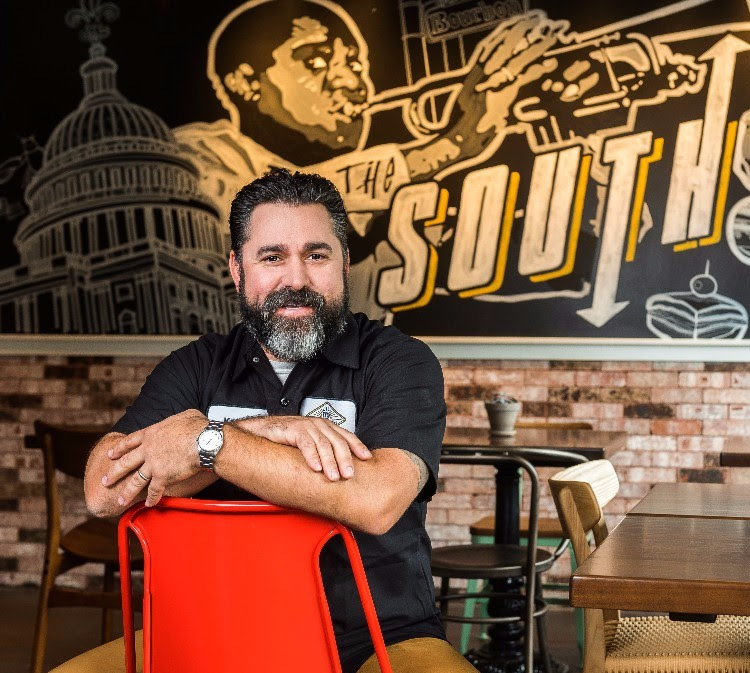 Lil’ B Coffee & Eatery by celebrity chef David Guas will bring a bright, airy vibe, with a touch of Southern funk to The Darcy hotel in Scott’s Circle, Washington, DC when it opens, Friday, September 8, 2017 at 6:30AM. The semi-industrial design is complete with stone countertops, exposed brick, black and yellow walls, and a custom graffiti style mural by local artist Aaron Scales. The handcrafted wood tables and counters are all bathed in light streaming through the ceiling to mid-level, front windows. Infectious sounds of R&B, Jazz, and New Orleans Funk are played from a collection of vinyl spinning on the classic turntable. Chic black-and-brass colored patio tables and chairs with oversized black umbrellas offer a refreshing outdoor respite. Leading his dedicated crew, TV personality and chef David Guas, is the culinary head of Lil’ B, infusing the atmosphere and cuisine with his colorful Southern roots. Guas takes inspiration not only from his native city of New Orleans, but also from beloved dishes of the neighboring southern states of Alabama, Mississippi, Georgia, Tennessee, and Texas. Also in the mix is the local culinary creativity of DC, a southern city with all the broad cultural influences of an international capital. Guas will also feature spontaneous offerings he calls ‘just because’ that are purely inspirations of the moment. Tapping into the neighborhood’s cool vibe, Guas presents two unique liquids on tap. Flash Brewed Ice Coffee is kegged on the spot, a rare procedure to complete in-house – it is then tapped with nitrogen, offering a one-of-a-kind bright flavor. The other tap showcases his love of honey with flowing Elderberry Mead from Charm City Meadworks – not many can claim to draw mead as a draft. This season’s Elderberry mead is a light, rosé-hue served in a 10-ounce custom goblet. The coffee, both filter and espresso-based, hot- and cold-brew, made with Counter Culture Coffee, takes center stage with La Marzocco Strada – the finest technology available, produced by an Italian company that has been crafting espresso machines since 1927. The Cortadito, an inspired double-shot coffee with steamed milk, and the Café con Leche is offered as a tribute to Guas’ rich Cuban heritage. 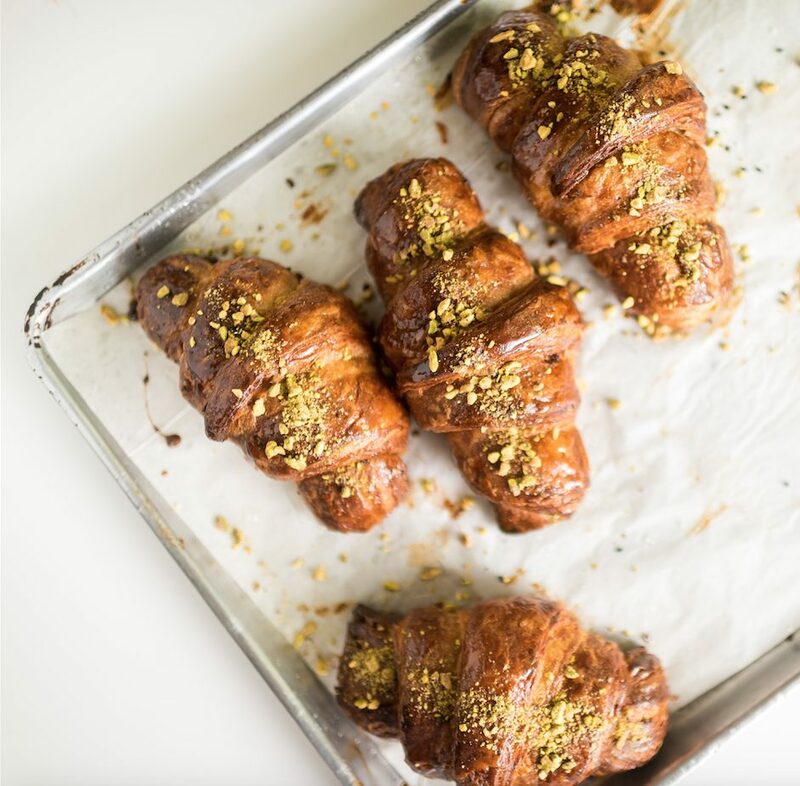 From the menu section, “Good Morning Y’all,” breakfasters can choose from the jam-packed pastry case of freshly baked, buttery goodness, whose newest additions are the Everything Croissant filled with Whipped Chive Cream Cheese and the Baklava Croissant soaked in Honey and Pistachios. “Mid-day Grub” offers something for everyone with quick grab-and-go choices of Chicken, Shrimp, or Egg Salads and the irresistibly cheesy Pimiento Cheese. Loaded Southern sandwich options include the ‘vegged out’ Hippie Melt and Guas’ signature Muffaletta, which was named the #1 Best Sandwich in the U.S. by Food & Wine magazine in 2017. “Booze & Brews” brings innovative Cocktails, Virginia Wines, Craft Beers, Mead, Bottled Sodas, House-made Lemonade, and the sweetest of freshly brewed Iced Teas, herbal or caffeinated. Take advantage of the daily Happy Hour from 5PM-7PM. All day, guests can indulge in “Sweets in Between” with exclusive treats found only at Lil’ B. Try the Lil’ D — an Oatmeal Cream Cookie Pie, a retro riff on a Little Debbie. Snickerdoodles will satisfy the continued nostalgic cravings.